Ballinlough followed up their opening round draw to Castletown, with this disappointing loss to Walterstown. The hosts were out of the blocks quickest when Robbie McDonald found the back of the Ballinlough net in the opening minutes, and they comfortably stayed in front from there. The ‘Lough lacked attacking impetus in the absence of Peadar Byrne, and found it hard to come by scores from open play, with Kevin Devine opening their account with a well struck free. Alban Crosbie kept the scoreboard ticking for Walterstown, originally lining out at full forward, but switching to centre-forward early on, where he quickly took control of the game. Ballinlough were given a lifeline mid way through the half when Tommy McCullen punched into the Walterstown goal after a free from Devine had dropped short. The incident leading to the free also saw Walterstown’s centre back, Christopher Reynolds, receive the first black card of the match. However, this was to prove to be the Reds last score of the opening period, as the hosts went on to convert a further 1-04. The half was brought to a close by a second well taken goal by McDonald, to leave the score at 2-06 to 1-01 in Walterstown’s favour. Ballinlough started the second half much more positively, also aided by a strong breeze. Good work by the industrious Ronan McGuinness led to successive scores by Devine and Jack Tunney. Substitute Gary Reilly was also unlucky to see a good goal chance trickle past the post. However, the visitors lack of a cutting edge in the final third, meant that they never looked likely to overcome the deficit. 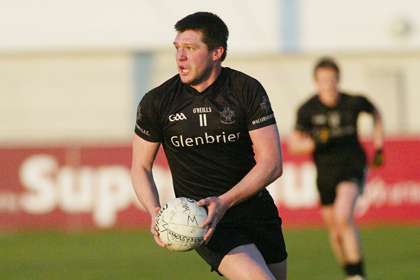 McGuinness earned the dubious honour of being the first Ballinlough player to receive a black card in the closing minutes, as Walterstown held out for a seven point victory. Ballinlough: D. Muldoon, R. Farrell, P. Muldoon, Colm Mallen, B. Smith, M. Geraghty, L. Maguire, Cian Mallen, T. McCullen, M. McCullen, R. McGuinness, N. Farrelly, J. Tunney, K. Devine, P. Briody. Subs: J. Baugh for N. Farrelly, G. Reilly for P. Briody, J. O’Higgins for Colm Mallen.